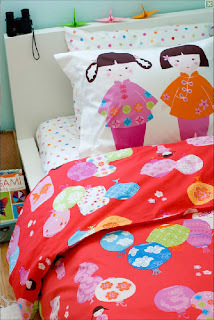 Roo has Pottery Barn Teen sheets on her bunkbed in a vaguely Asian style called "rice pattie." It's nice enough but when I saw the bedding options from Kukunest, I wished I could justify buying a whole new round of sheets. How totally adorable are their Lantern Festival coordinates? Sheet sets are $58, duvet sets are $119 online at Kukunest. ooh, those are CUTE sets! 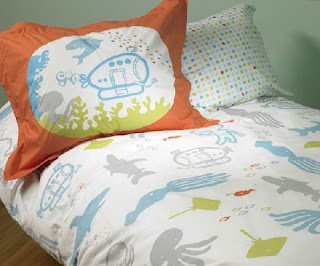 I have been wanting this same bedding for my boys room!